» Click here to begin the registration process. - Open to athletes 5-13 years old (House League to Rep level). - All 6 weeks of summer camp are at the CORE Lifestyle & Recreation Complex. - In situations where a camper is registered for more than one week, each registration fee will be $10 less than the cost of the previous week. - When registering more than one family member, a discount equal to $10 (for 2nd family member) or $20 (3+ family member) will be applied to the registration fee. - NOTE: Campers will receive a camp t-shirt for their first week of camp. Campers who attend multiple weeks of camp will only receive a t-shirt for their first week. - Please contact registration@eliteathletes.ca for special requests (i.e. single days or half-days). Soccer instruction to athletes 5-13 years (House League to Rep level) in a fun-filled summer DAY camp format. 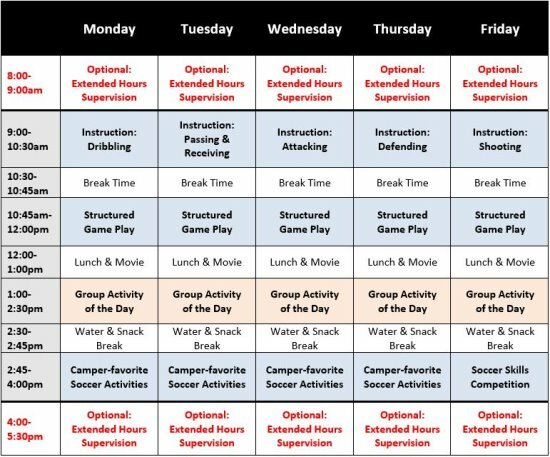 Daily emphasis on soccer (blue shaded areas on the schedule) with other sport/activity breaks (yellow shaded areas on the schedule). For the daily soccer components, campers will be divided by age & ability. MULTI-WEEK DISCOUNT NOTE: In situations where a camper is registered for more than one week, each registration fee will be $10 less than the cost of the previous week. FAMILY DISCOUNT NOTE: When registering more than one family member, a discount equal to $10 (for 2nd family member) or $20 (3+ family member) will be applied to the registration fee.